From her signature lemon and basil club sandwiches to her deliciously rich and ever-popular dark chocolate marbled mousse, Ruth Pretty certainly knows how to put on a good spread. 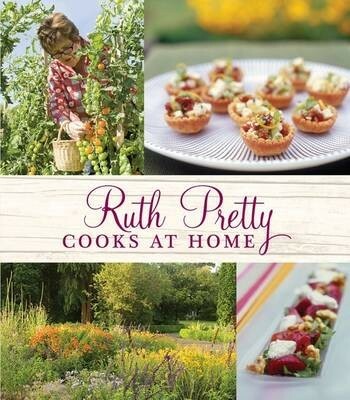 In Ruth Pretty Cooks at Home, Ruth shares stylish cooking ideas, entertaining secrets and more than 100 delectable recipes so you too can cook to impress at home. Whether it involves guests having drinks on the lawn, a casual weekend lunch on the verandah or a glamorous dinner in front of the fire, Ruth Pretty's own home is the ideal spot for entertaining. The established fruit trees, egg-laying hens and sustainable kitchen garden all support Ruth's passion for local, seasonal, fresh food, and provide the perfect backdrop for her latest cookbook. So gather some friends and family around your table and join one of our best-loved chefs and caterers in Ruth Pretty Cooks at Home, a cookbook to treasure and enjoy.